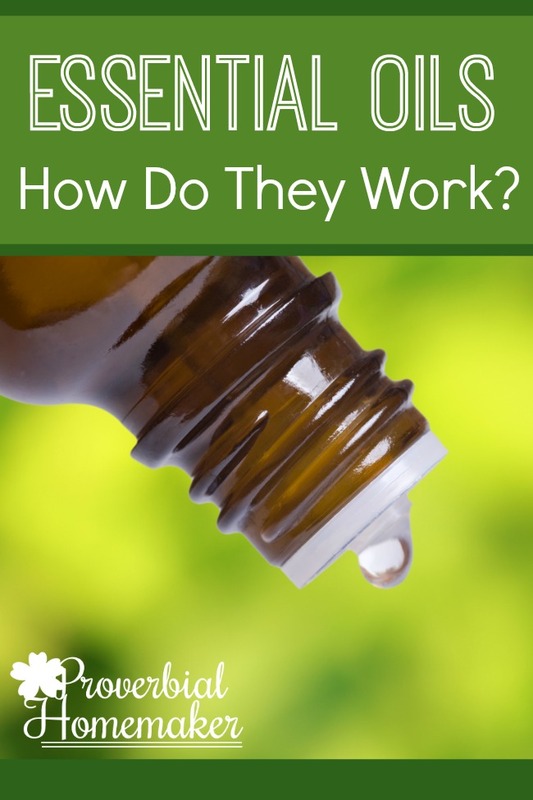 Have you ever wondered how essential oils work? You apply them or breathe them in. Then what? How do they actually interact with the body? Is there proof they work at all? As I set out on my skeptic’s journey with essential oils, the first thing I wanted to do was get to the proof. What is the science behind essential oils? Why are essential oils effective? Today I’m going to share with you what I found. Keep in mind, I learned what I could with the time and resources I had, and continue to take various sources of information into account. All of my information is from sources that I link to at the end of this post. Essential oils are volatile, meaning they evaporate when exposed to the air and have a strong aroma. They are not oily to the touch, and are slightly water soluble although they mostly behave like fixed oils in that they don’t mix easily with water. Essential oils are the “essence” of a plant which can be extracted from seeds, roots, stems, leaves, flowers, fruit, or bark. Essential oils can be extracted in various ways, usually expression (for citrus oils) or distillation. The liquid that results contains the “essence”: a concentration of the aromatic and chemical properties of that plant. What Makes Essential Oils Effective? More, including – Peroxides, lactones, carboxylic acinds, furans, etc. Essential oil molecules are extremely small and are therefore very easily absorbed. Although each constituent may make up less than 1% of an oil, they can have a huge influence on the body by interacting with different systems in your body. Essential oils effect your body primarily through aroma and absorption. When you smell an essential oil, the cilia and receptor cells in the olfactory organ receive the molecules and send signals to the lymbic system of the brain, which is also the center of memory and emotion. So you can see how an essential oil with higher amounts of esters and aldehydes (like lavender) would have a calming effect when inhaled. When essential oils are absorbed through the skin or lungs, they are distributed throughout the body and interact with various organs and bodily systems. Your blood system functions as a highway delivering essential oils directly to your organs. Why is Essential Oil Chemistry Important? Now that you understand a little better how essential oils work, you can see why they may be very effective and should also be handled with care. Just because they are natural, doesn’t mean there may not be safety considerations. Do your research before you use any oil or blend so that you know you are using it properly and safely! In addition, knowing which elements and compounds are prevalent in an essential oil will help you understand how it will work in your body and guide you if you decide to try to mix oils into your own blends. It will also help to know if the essential oil has different chemotypes. A chemotype is a way of identifying that the plant species can have different chemical constituents based on different environmental factors such as environment or soil quality. What does this mean? It means that essential oil extracted from a plant grown in one part of the world can have a very different chemical composition (and therefore aroma and therapeutic effect) as the same plant grown in another part of the world. 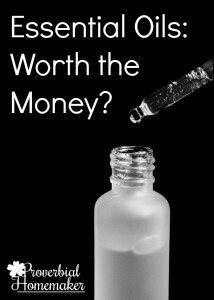 This is worth knowing as you research and purchase essential oils for your family! People usually use essential oils topically, through inhalation, or by ingestion. Which method you use will vary depending on your preferences, the oil you’re using, and your safety concerns. For example, there are certain oils you should not use on young children or pregnant or nursing mothers. There is also much debate about ingesting oils, which I will write about more in the future. Inhalation of Essential Oils. We talked about how the aroma of an oil can interact with your body. Inhaling oils delivers droplets to cilia in your nasal passages where they are received by receptor cells and cilia in your olfactory organ. Droplets also reach your lungs where they are absorbed into the blood stream. How do you inhale essential oils? This can be as simple as breathing in from an open bottle, from applying drops to a tissue and breathing it in, or with a diffuser. Some believe that inhaling oils is the most effective and direct way to use them. Applying Essential Oils Topically. Essential oils can be applied to your skin where they are then absorbed into the blood stream. It is argued that applying oils in certain areas (soles of feet, temples, wrists, under arms, etc.) is most effective because they are pulse points or are more permeable than other locations. Essential oils should always be used with a carrier oil when you are applying them topically, diluting them to a proper and safe ratio. Some folks insist that certain oils can be applied neat (without a carrier oil) but I don’t believe that is necessary and can sometimes be unwise. More on that another time. Ingestion. This is another debatable topic. Many people ingest essential oils and have done so for years without any noticeable negative effect. Some books and companies will also promote ingestion. Again, I personally feel it is not necessary and may sometimes be unwise. I don’t go around scolding people for it though, because I simply don’t know enough about it either way. The bottom line, however, is that I have not had the need or interest in ingesting oils, so since the safety of doing so is questionable, I just don’t go there. Whatever you choose, I encourage you to do your research and not rely on the recommendations of a sole blog, book, or company. We are all fallible. What Proof is there that Essential Oils Work? Of course, I was very interested in nailing down the proof that essential oils work. That is easier said than done, however. For various reasons, finding mainstream academic research and analysis of essential oils and how they work is not exactly a piece of cake. When I was initially researching, I discovered a few clinical studies that talked about topical application or inhalation of oils such as lavender and how they effect the moods of ill patients. I was surprised to read that there was a strong indication of positive mood effects with essential oils. Of course, it was just a few studies so it wasn’t exactly conclusive evidence. 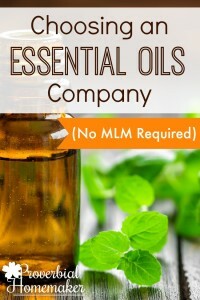 While what I found at the time was interesting and helpful, and I have learned much more in the past two years, I still came to understand that there really isn’t an abundance of reliable research available on essential oils at this point. There just isn’t. Perhaps it’s because there’s no big money in it for the folks who would be running the studies. I am hopeful that as people start asking for more evidence and research, more rigorous studies will be done. However, I was convinced enough by what was available, along with the experiences and recommendations of people I believe are reasonably sane and intelligent, and decided to take the leap. 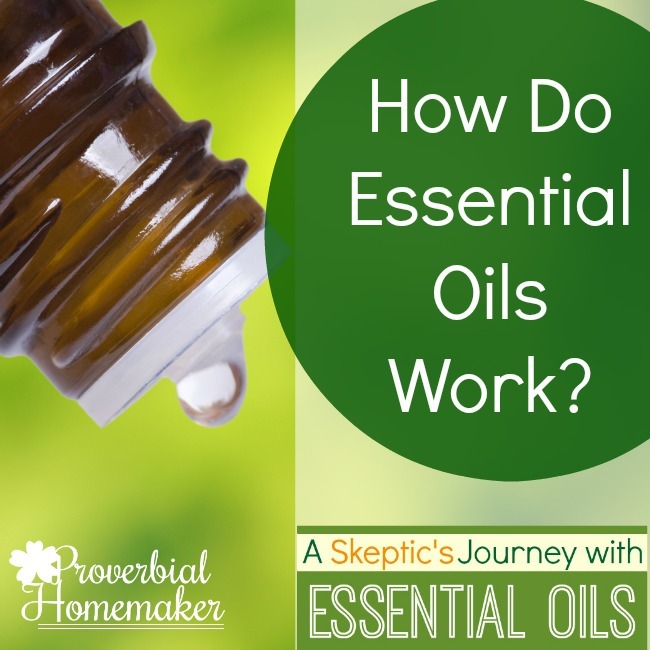 I set out to test out essential oils and see if they could be beneficial for my family. In the next post I’ll talk about how I decided which company I to go with for that test run, along with a list of companies I’d recommend. I the meantime, I want to hear from you! What questions do you have about how essential oils work? *FDA disclaimer: “These statements have not been evaluated by the Food and Drug Administration. This product is not intended to diagnose, treat, cure, or prevent disease.” The information in this post comes from various books and web sites that I have listed for you here. I would love to know how expensive of an adventure is this to start. I have always been curious about them. On what capacity have you used them? I would like to start with calming and also for medical purposes. It would be great to have something to use with sinus congestion illness that pass so easily in families. hi Karen! It doesn’t have to be expensive at all. I started with basics like lemon, lavender, tea tree oil and Immune Strength from this company. Free shipping, too! (aff) http://go.rockymountainoils.com/SH9a. That covers all your concerns and is a great place to start! Thanks for stopping by! I am totally sold on oils. When I started in September I had bronchitis, but had not seen the doctor yet. I got on a routine application and inhalation of lavender, lemon, peppermint and RC. Within a few hours I noticed a difference. Within 24 hours I was considerably better. By 48 hours I no longer felt the need to see a doctor. Within a few more days I was pretty well over it. Now,whenever we start to feel a cold coming on, we get on the routine and it knocks it right out. Essential oils when used properly is very useful. We diffuse oils all the time now. They have helped with focus, PMS, allergies, colds, inflammation, pain. Thank you for this post and I look forward to reading your choices for companies. Absolutely Jennifer! Sometimes the proof is in the pudding, right? Thanks for sharing that! Just want to say I love your site. I have enjoyed setting up a planner and being more prayerfully focused on homemaking and homeschooling. I am just now beginning my research on essentials oils and am very happy that I will be able to read what you have learned as well. I am convinced that there are benefits in essential oils. My concern is playing it safe when it comes to my health and remaining overly cautious. I have a rare, nasty and at times aggressive auto immune disease. My doctors go to great lengths to suppress my immune system to control my diease yet not putting my health at risk any more than necessary. I certainly do not want to do anything to boost my immune system and give my “monster” any more advantage. So as I research for my family’s needs and my own I must always consider my “monster” in the equation! Looking forward to reading more on your investigation. Thank you for all the help and encouragement you provide. Blessings! I’m so glad Nicole! I hope it helps you out. I’ll be sharing a LOT on essential oils safety in the coming weeks here on the blog. That sounds like a unique situation! I might suggest contacting a certified aromatherapist to see if they have specific suggestions. Thanks for sharing! I just started to follow Rocky Mountain Oils and saw there post on IG about this course! I’m very new to oils and so excited about this course. I read on your post that oils can be inhaled via diffuser. Do you know if someone has slight asthma if it causes problems? It’s surprising that ppl think that inhaling is the best way to use the oils. I ordered a few from Rocky Mountain for my son which I plan to use roller balls. Hi Jenica! It depends on the oil. Some oils should not be diffused if someone in the house has asthma. It’s best to look up the recommendations for each single or blend until you know which ones can/cannot be diffused. The reason why inhaling and topical application is so effective is explained in the article. Inhaling gives droplets of oil quick interaction with the lymbic system of the brain as well as absorption into the blood stream. We use roller bottles and diffuse the oils all the time. It’s great to have both options! But yes, definitely be sure to check whether there are cautions against diffusing a certain oil for asthma. Thanks for sharing your knowledge and research. I’m fairly new to oils and am very excited to learn more! Waiting on my RMO order to arrive. First timer! Can I use more than one at a time for different aches and pains? Also, if I apply topically, how often do I do it?